The U.S. is known for having a pretty complex tax code. The individual income tax code alone has several provisions that interact with one another and impact how much taxes people pay at all income levels. Provisions that phase-in and phase-out create spikes in peoples’ marginal tax rates. If the tax code is advertising a 10 percent marginal tax rate on your next dollar, but takes away a little bit of your Earned Income Tax Credit, what you are really paying is higher than 10 percent. This complexity masks what the tax rates actually are. The United States has a progressive individual income tax. This means that as individuals earn more income, they face higher marginal tax rates on each dollar. Chart 1 shows what this looks like for a single individual with no children for each dollar between $1 and $500,000. As income increases (the X-axis), the marginal tax rate increases (Y-axis). For instance, an individual who earns $40,000, will pay a 15 percent tax rate on the next dollar, while an individual who earns $150,000 will pay 28 percent on the next dollar. In total there are 8 marginal tax rates (including the 0 bracket created by the standard deduction and personal exemption) that range from 0 percent to 39.6 percent. If we were then to look at the phase-ins and phase-outs of provisions that affect both and individual’s tax rate and their taxable income, there are far more marginal tax rates than are advertised. Chart 2 shows the marginal tax rates from $1 to $500,000 for a single individual with no children that earns wage income and takes into account the effect of the tax brackets plus the Earned Income Tax Credit, the state and local income tax deduction (assuming a 5 percent state income tax), the phase-out of the personal exemption, and the limit on itemized deductions on marginal tax rates. 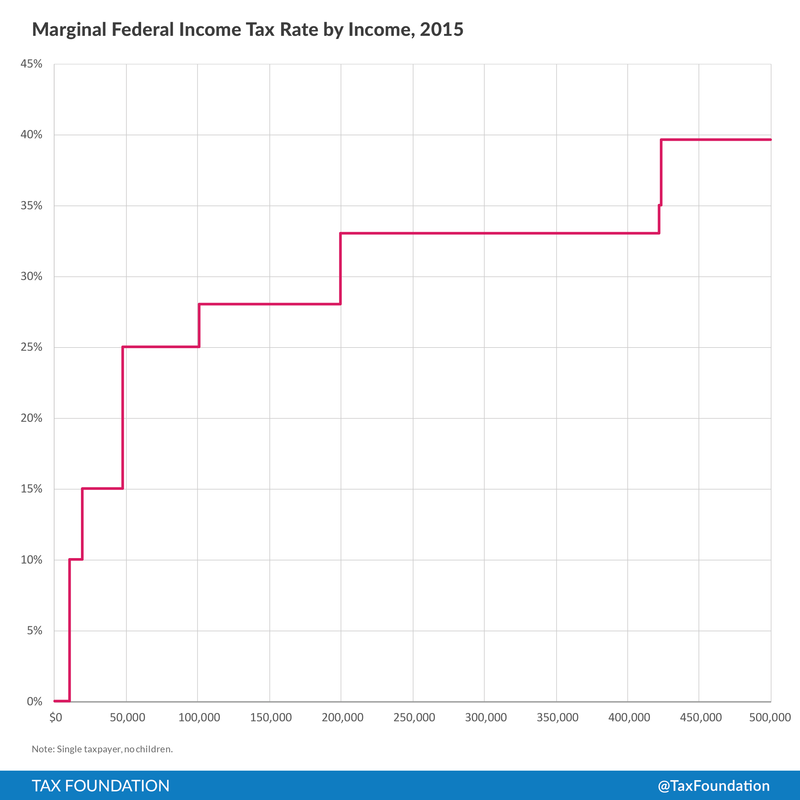 The number of marginal tax rates faced by a single taxpayer with no children increases from 8 to 14 different marginal tax rates that range from -7.65 percent to 38.8 percent. 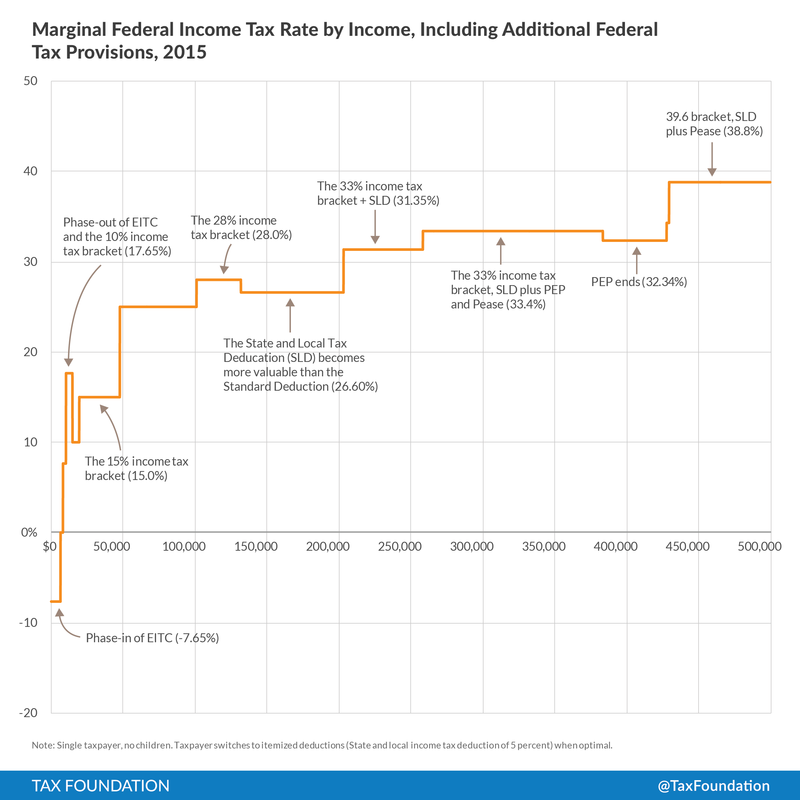 At lower income levels (between $1 and about $30,000) marginal tax rates bounce around a lot. This is due to the Earned Income Tax Credit (EITC). The EITC phases in at 7.65 percent, meaning that for every dollar an individual earns the federal government will supply an additional 7.65 cents. This creates an implicit marginal tax rate of negative 7.65 percent. Once a taxpayer reaches a certain level of income, however, the EITC phases-out. This creates an implicit marginal tax rate of 7.65 percent. Combined with the 10 percent tax bracket, an individual earning $10,300 of wage income faces a marginal tax rate of 17.65 percent, which is a higher marginal tax rate than someone earning $30,000 of wage income would face. At the very high end of the chart (between $200,000 and $500,000) there are a few more marginal tax rates. This is due to the phase-out of the personal exemption (PEP) and the Pease Limitation on itemized deductions. Starting at $258,250, the $4,000 personal exemption phases-out at 2 percent each additional $2,500 you make. This means that the government counts every $2,500 of income as $2,580. This has the effect of adding an additional 1 percent to your marginal tax rate between $258,250 and $380,000. The Pease limitation adds an additional 1.18 percent on every dollar over $258,250. Other provisions that were not included, such as payroll taxes, the child tax credit for taxpayers with children, and state and local income taxes (and the phase-ins and phase-outs associated with them) all add to the number of marginal tax rates for individuals. 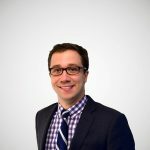 There are convincing arguments for some of these features of the tax code, such as the EITC, but it is important that in general a tax code avoid hidden marginal tax rates. It makes the code complex, which hides peoples’ true tax rate. Tax reform on the individual side should limit these sorts of games.